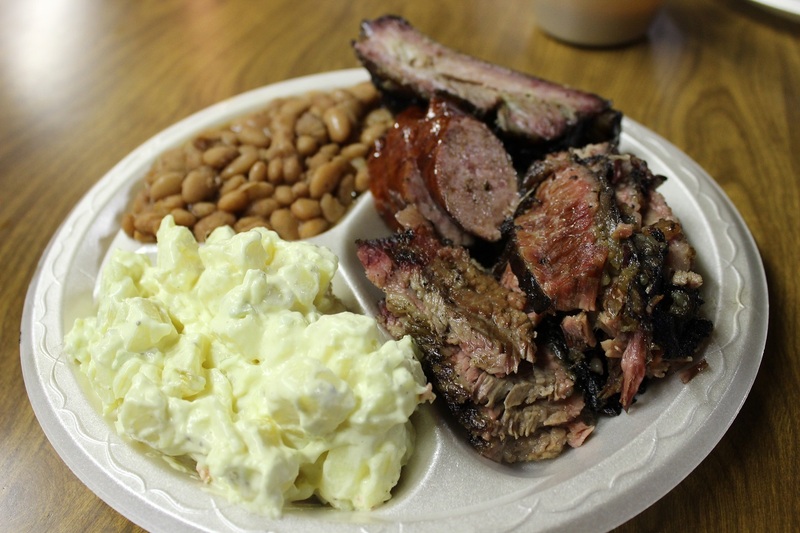 BBQ joints across Texas share a wide variety of layouts. From small grocery store-meat markets to giant combination gas station-convenience store-restaurants and from simple trailers with a single smoker to cavernous buildings with tons of meat capacity the dining experiences in Texas BBQ vary more than the weather here. 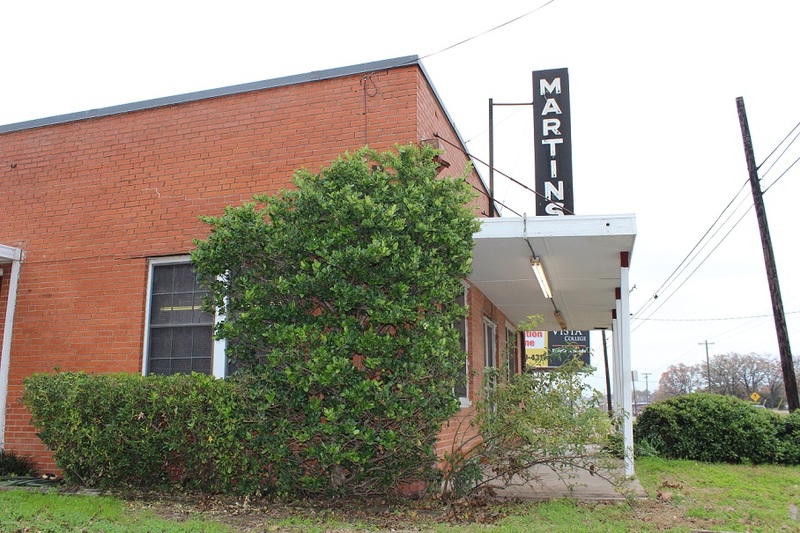 Martin’s place is a simple and historic building that sits alongside South College Avenue in Bryan, Texas. Driving down Texas Avenue, which is the old Highway 6 and runs parallel to South College, is like a road into the past. If you squint your eyes a bit and focus on only the older facades you can see buildings from the 50′s and 60′s scattered along the roadside. Small roadside motels link back to a time when travelers simply stopped when they tired; it was difficult to pre-plan your motel stays before the internet and travel planning sites. The road reminds me of Route 66 although the newer construction can blot out the visuals. Martin’s place is a throwback even further; the current building was erected in 1939 and the original building was established in 1924. It even sports a Texas Historical marker out front. Martin’s was to be an add-on and third stop to our day’s festivities. L&L Old Fashioned BBQ and More was our first stop but they were inexplicitly closed. I had some great brisket on my last trip there but wanted to follow up before writing a full review. Next up was Fargo’s but the parking lot and tables were full so we decided to hit Martin’s first then head back to Fargo’s. We pulled up into the dirt parking lot at Martin’s with high expectations. I swung open the door and even though it was a little after noon on a Saturday, we were the only customers. I thought this was pretty odd but was busy taking in the interior. The first thing that I noticed was the smell. Old smoke permeated the room. This wasn’t like a chain BBQ joint that ducts smoke near the front door in order to entice customers, but rather something that only years and years of smoke can impart. The vintage wood paneling must also help soak in the aroma because the smell was thick. 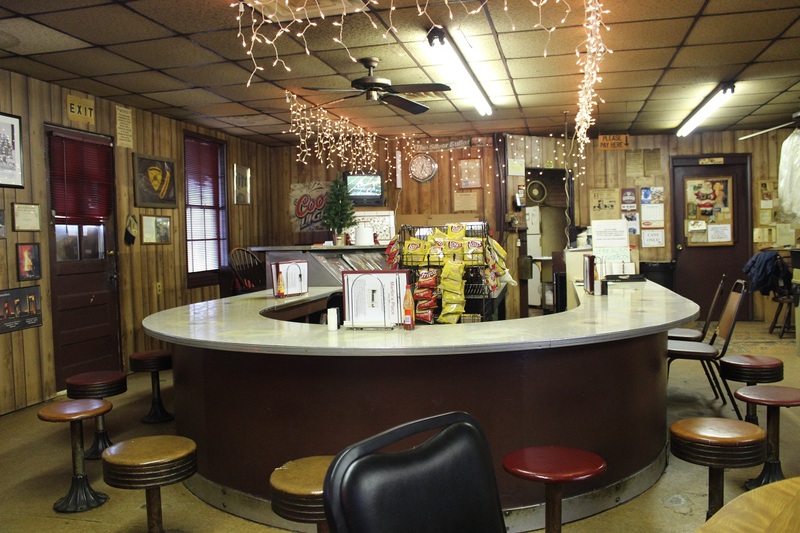 The next thing I noticed was the horseshoe shaped counter top and ancient bar stools along with the no-longer in use meat market counter. The counter tops had been worn down in places. It was as if front door was a time portal. This place just oozed history. I could fully imagine families here from the 40′s and 50′s sitting around and eating what would be essentially the same food, cooked in the same manner and in the same BBQ pit that has been had here for more than 70 years. The menu was very reasonably priced so we ordered up a 4 meat plate with sausage, ribs, and a double order of brisket for only $11.25. That’s right, only $11.25. Our waitress headed back and prepared our order as another customer ambled in. By the time we left there was another customer or two but the lunch rush was anything but. The customers here all looked to be regulars as well. This was a far cry from Fargo’s where the line would be full of college kids and what I assume are BBQ tourists. This is the experience I prefer; and I would have liked to spend a little more time. I do plan on stopping in again on my next visit to the area. Our plate arrived heaping with food. Even though we split one plate between the two of us we wouldn’t be able to finish off the sides. As usual, first up was the brisket. It looked good and had the proper tension when pulling apart. The fat was well rendered. However the rub didn’t provide any flavor and the meat could have used more smoke flavor. I was a little confused since they use a 100% wood fired pit and we were there when the meat would have been fresh off the pit. The sauce was our least favorite item; it tasted of tomato sauce and in my opinion didn’t compliment the meat well. But I don’t go to BBQ joints for the sauce anyway. The sausage was interesting; while it was a very fine grind like commercial sourced, it virtually fell out of the casing when bit into. It was good but not spectacular. The ribs were similar to the brisket in that the rub and smoke flavor were light but they were very well cooked, with the meat just barely clinging to the bone. I liked the potato salad which was creamy with both mayonnaise and mustard, and the pinto beans were an adequate side to complete our meal. My first trip to Martin’s didn’t blow me away but it was good BBQ and deserves a repeat visit. I wish the rub was better as the brisket could use more seasoning and that holds it back from being achieving a higher status. On this particular trip it did favor very well compared to our Fargo’s brisket that we tried immediately after, which tasted a bit watery. It also certainly was more enjoyable as we couldn’t score a table at Fargo’s either on our first or second attempt of the day. If you have never been to Martin’s it is surely worth a stop.